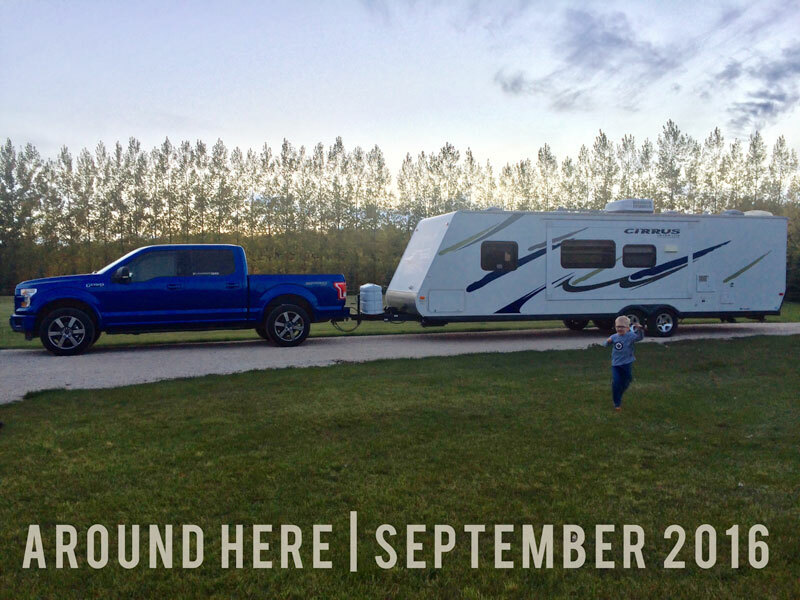 Around here we traded in our Ford Edge became proud new owners of a truck and a camper trailer! Yay! So looking forward to doing some camping next year! (The previous owner had already winterized the camper for this year). Around here JJ started preschool, and he is loving it. It's so awesome to see him growing up and getting some independence. His teachers are both really great as well. We're so happy with how this transition has gone! Around here our little wild child, Austen, turned two and had the best time at his birthday party! We went to a children's play centre, and everyone had a blast! Around here Jason and I celebrated our seven-year wedding anniversary! Time sure flies! September has been a very full and busy month, so we haven't had time to do anything for it... but hopefully we'll get a chance for a date night this month. Around here Austen has started Kindermusik for the fall, and it is not going well. He has no interest in it, and just wants to escape the classroom and play in the hall by himself the whole time... ugh. Around here I got a new iPhone 6s! I've had a Samsung Galaxy S5 for the past two years, and just wasn't happy with the photo quality I was getting (which seems weird, since all I ever read is about people getting awesome photos out of their Samsung phones...) I'm getting much better results with my iPhone! Around here we discovered that Austen can open the front door by himself one day when Jason got home from work. Austen was so excited to see him, he opened the door.... and let all three dogs out at the same time. Milo didn't get far, but Jason had to chase Parker and Maggie for a good 10-15 minutes before he caught them. Around here I had so much fun on my 'date' with JJ - we went to a Winnipeg Jets pre-season game. He is hockey and Jets obsessed, and we had so much fun! Had some treats, watched a good game, and even got to get a picture with the mascot, Mick E. Moose. So much fun.